I'm going to depart from my usual format to a Q & A format for this review. 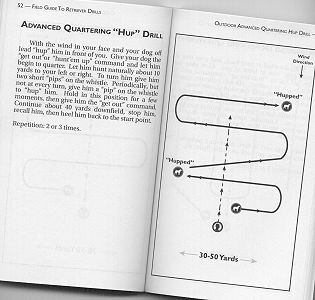 When Chip and Tony wrote Urban Gun Dogs, I remarked that it would be really great to have the training drill diagrams in a small format booklet that could be carried in the field. This book is a result of that discussion, so I guess I'd have to say while I have no stake in this book, I am somewhat enthusiastic about the project. Bill: The most obvious question pertains to the cover. Both you and Tony work with spaniels. What is that black dog? Chip: Tony and I work with flushing dogs which includes both spaniels and retrievers. The Field Guide to Retriever Drills outlines techniques that are readily adaptable to both breeds. We feel that these drills will help novice and intermediate handlers of flushing dogs prepare their dogs for the field. I think that we also feel that the current training techniques for flushing dogs have, to a certain extent, become far too specialized given the differences in evaluation criteria between spaniel and retriever field trials and hunt tests and the training techniques of many professional trainers. There is substantial common ground between spaniels and retrievers -- especially when preparing them for the field. Bill: Explain the need for a spaniel drill "field book". Chip: I think that there is a distinct need for a book that one can take out to the field and refer to while training. A text book is an excellent reference guide, but difficult to use when actually conducting training. This guide is specifically designed to accompany the trainer to the training ground with a flexible binding and simple, easy to follow graphics that detail a large number of drills. Bill: Who would this book benefit? Chip: The book is designed specifically for the novice and intermediate trainer. It has a step-by-step approach that can help a dog owner train a dog from puppy to mature field dog. Each section of drills builds upon the previous section in a logical manner. Bill: How does this book tie in with "Urban Gun Dogs"? Chip: When designing and writing this field guide, we essentially reduced Urban Gun Dogs to a series of drills re-enforced with graphics. 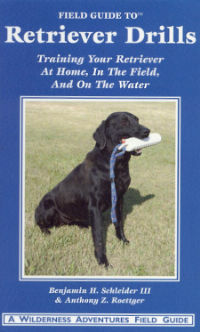 The two books, despite their disparate titles, actually track quite well with each other, and the philosophy that we bring to flushing dog training -- spaniel or retriever -- is consistent throughout each book. Bill: Concerning the spaniel novice, what is the most common mistake? Chip: We would have to say that the lack of consistency and simplicity in training and commands are most common mistakes novice or intermediate trainers make. Dogs tend to learn through repetition. If a trainer is inconsistent in type of command or frequency of training, the dog essentially starts over each training session. Moreover, dogs generally do not understand English sentences. Simplicity refers to keeping commands within one or two words. Our experiences with novice and some intermediate trainers show us that consistent and simple training and commands sets the stage for success. Tony Roettger is a professional trainer and operates Roettger Ridge Kennels. 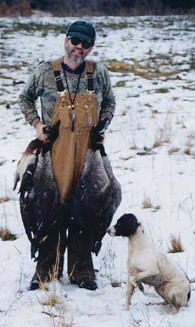 Chip is an avid amateur spaniel trainer and upland game hunter. He owns four dogs: one English springer spaniel and three English cocker spaniels. Besides that, he is an excellent writer; his stories have been a regular item in the Spaniel Journal for many years. The teamwork of Tony and Chip produced Urban Gun Dogs which is a very readable training book. This field guide, with or without the earlier book, will be very useful to the trainer who finds himself falling into a rut and not giving his dogs the full skill set they need.